Armand "Stitch" Vari did his high school football playing for St. George High in Pittsburgh, where he was good enough to be named to the All-Metropolitan second team. After he graduated, he served in the Army and then chose to come to the University of Miami as did so many Pittsburgh area athletes in those days. He was on the freshman squad in 1949 and showed up the following Fall as a candidate for the quarterback spot, of all things. His rivals for the job were Jack Hackett, then a junior and Jack Del Bello, a senior. The 5 foot 11 inch Vari was listed in the brochure at considerably over his real weight. The 180 pound listing never came really close to Vari's real poundage--he was in the 160 pound catergory much of his playing career. Though coaches respected his defensive ability--shown by the gusto he hit ball carriers, there was no way he could break in at quarterback. That was bad news for the fiery Vari. However, when problems began developing at offensive center, Vari assured his coaches he could do the job. He got the chance and did the job. Overnight, he became a first rank offensive center. His downfield blocking added such long gain zip to the Miami attack that the Hurricanes wound up in the 1951 New Year's Day Orange Bowl Classic. 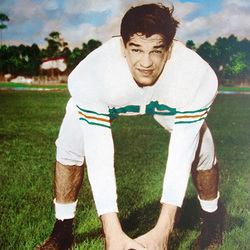 Armand played center on the first regular season undefeated team in Miami history. It was this year that the UM won stunningly over Purdue, the week after the Boilermakers had stunned the college football world by snapping Notre Dame's sensational win streak at 37 games--and it was upon the team's return that the greatest traffic jam in the history of mankind was created ! More than 100,000 hysterical Miami fans greeted the team at the airport ! The city went mad ! Miami also won that year over Missouri and Iowa of the Big Ten, Pittsburgh, Florida and every other foe they met in 1950, until losing the Orange Bowl game 15-14 to Clemson in a thriller. In the triumph over Iowa, and Iowa guard said Vari was the best center he had faced all year--even though "Stitch" was only in his fourth game at the position at that time. Two more great years followed for Vari, including a Miami rematch victory over Clemson in the next year's Gator Bowl game. Few Hurricanes players have had to take so much battering--Vari was outweighed 50 or more pounds many times, but Stitch never gave up and set the pace of being the winner he was then and has been ever since ! Vari joined Andy Gustafson's coaching staff back in 1958 and remained at Miami through 1963. during that period, UM went to 2 bowl games, the 1961 Liberty Bowl and the 1962 Gotham Bowl. Vari assisted as a volunteer coach with Walt Kichefski in 1970 and with Coach Fran Curci in 1971 and 1972. Earlier, he was an assistant at Archbishop Curley High in 1955-56 and head coach and athletic director of the school in 1957 when his team went 9-1. He was a lieutenant in the U.S. Air Force in 1953-55.